Are you an advanced lifter but fuel your muscle gains like a beginner? Or are you a beginner that doesn’t eat well enough to support your muscle building goals? First of all, let’s clarify who is a beginner and who is advanced. In general, with respect to muscle building ability, a beginner is a person with approximately 6 months to 1 year’s worth of training experience. And by this I mean REAL training, not sitting around in the gym, drinking a shake and picking up girls or dudes! If you have 2 years of solid training experience, you are most likely advanced. However, don’t forget, that there is no precise transition between these stages; they happen gradually. Beginners have a very long post-workout anabolic window, which means they grow muscle for up to 72 hours after a workout. In contrast, if you already have some training experience, approximately one year or longer, your anabolic window shortens and reaches to less than one day at the end. If you are advanced, most of your muscle are built only within the 6 hours after your workout. This means that you should support your muscle gains in this period as much as possible by making sure you get enough protein and sufficient calories. The strategy you can use is eating less and having smaller meals further away from your workout and have large pre- and post-workout meals. By having a meal before your workout, you ensure that protein is in your bloodstream when you need it, which is straight after your workout. You also won’t waste valuable muscle building time on digesting food instead! If you're a beginner and your goal is muscle gain, you can just have equally large meals with sufficient protein at all times, if you train every 2 to 3 days. 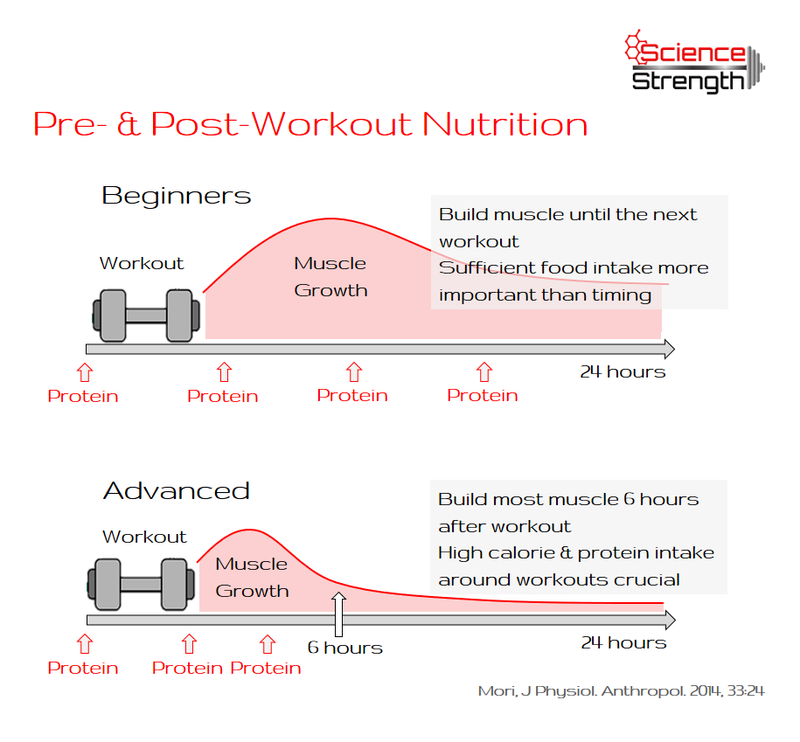 If you are intermediate, somewhere between a beginner and advanced, then your anabolic window is somewhere between 24 and 72 hours, like at 48 hours for example. Take-home message: Your training stage determines how you have to arrange your meals and your energy and nutrient intake throughout the day. Are you confused about what macronutrients you should be following? Do you find yourself struggling with knowing how to fit them in? Would you like a customized meal plan that is designed with your goals and progression in mind? Then you will love my customized macros package!